If you currently are or have been considering refinancing your home loan but have put if off because life happens, your opportunity may be coming to a close. Trump's victory speech in the early hours of Wednesday included a pledge to spend on rebuilding America's infrastructure — a plan that should stir economic growth and mean substantial new debt. These comments might be what the US economy needs to get moving again after 4+ years of relatively flat growth. They are also inflationary in nature. Which is bad for borrowing rates. This new exacerbates the fact, mortgage application volume fell 1.2 percent last week from the previous week, according to the Mortgage Bankers Association and was down nearly 11 percent in the past four weeks, as rates have already climbed from historic lows. 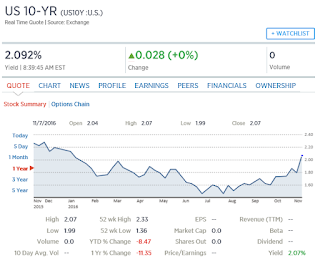 As of this morning (November 10, 2016), the 10-year note was yielding 2.07 percent, the highest level since Jan. 14, and the 30-year was at 2.86, also a January high in afternoon trading. 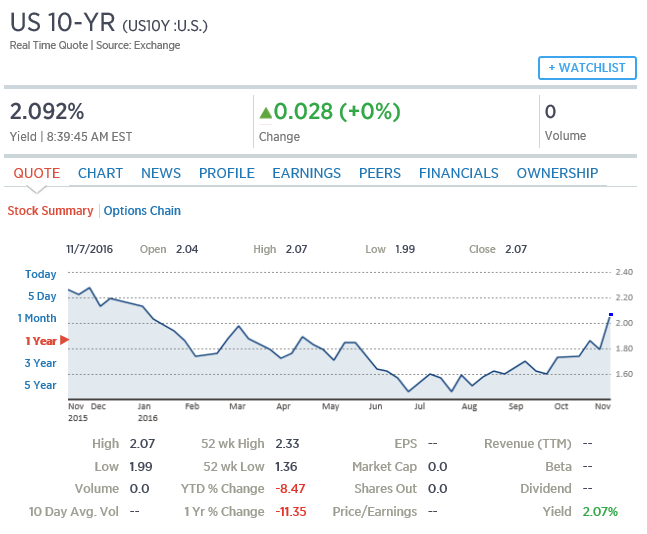 It was the biggest one day jump in the 10-year yield since Aug. 11, 2011. "Globally, rates have begun to creep upwards as investors anticipate less aggressive monetary policies from central banks, and U.S. rates are being pushed upwards in response," said Michael Fratantoni, the MBA's chief economist. "Additionally, new data shows continued positive signals regarding the job market and rising inflation, indicating that the Fed is likely to hike in December and will continue increasing rates next year." In closing, the interest rates in the mid-3’s for government loan programs, such as FHA & VA, could be gone as quickly as months end as upward pressure on the 10yr gains momentum. If, as many expect, President-Elect Trump rolls out the trillion dollar infrastructure plan, we may very well be looking at interest rates in the upper 5% range by this time next year.